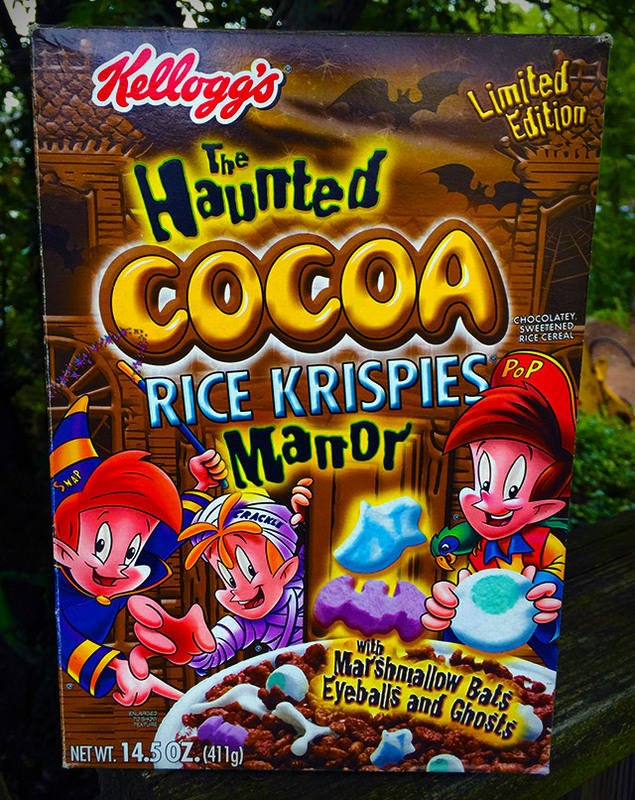 Spooky Cereals from Beyond the Grave! | Dinosaur Dracula! I try to work one “retro cereal box” article into every Halloween Countdown, mainly for the excuse to spend more money on old cereal boxes. Help. 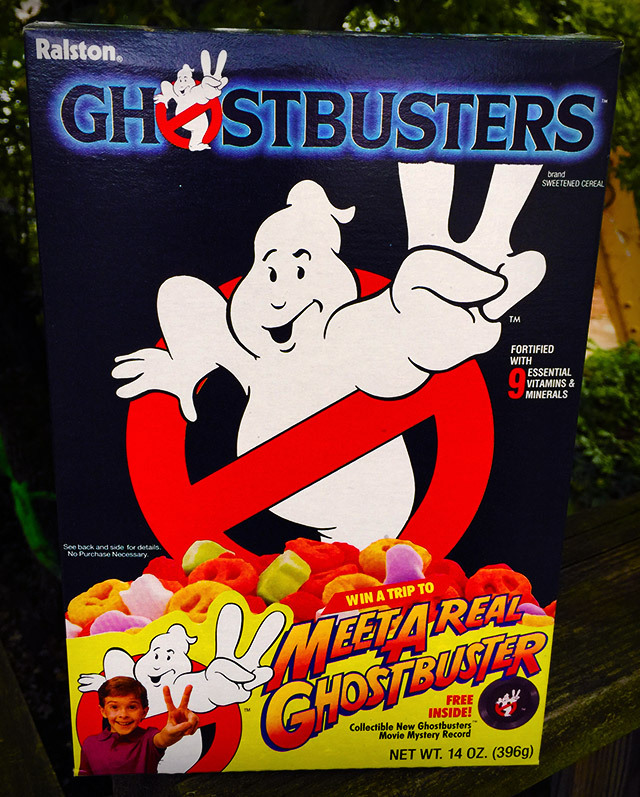 In one form or another, Ghostbusters Cereal remained on shelves from 1985 through 1991. It was a wildly impressive run for a tie-in cereal, since those usually last less than six months. Years later, when Ghostbusters II was just about to hit theaters, Ralston capitalized on the hype with another name change, this time to Ghostbusters II Cereal. And that wasn’t even the last rebrand! The final version of Ghostbusters Cereal came out in 1990 and only barely made it through the year. 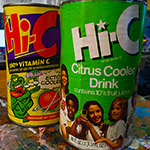 After the cartoon series was rechristened Slimer! and The Real Ghostbusters, it was only logical that the cereal would follow suit. 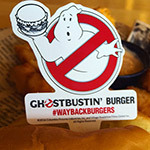 Some fans resent this era of the cartoon, believing that the increased focus on Slimer robbed the series of its dry-and-mature motif. Though the “goofier” Slimer stuff was mostly limited to his own animated shorts, I don’t think any objective person would say that the show’s last season was better than its first. On the other hand, even the worst episodes of The Real Ghostbusters were still episodes of The Real Ghostbusters, y’know? 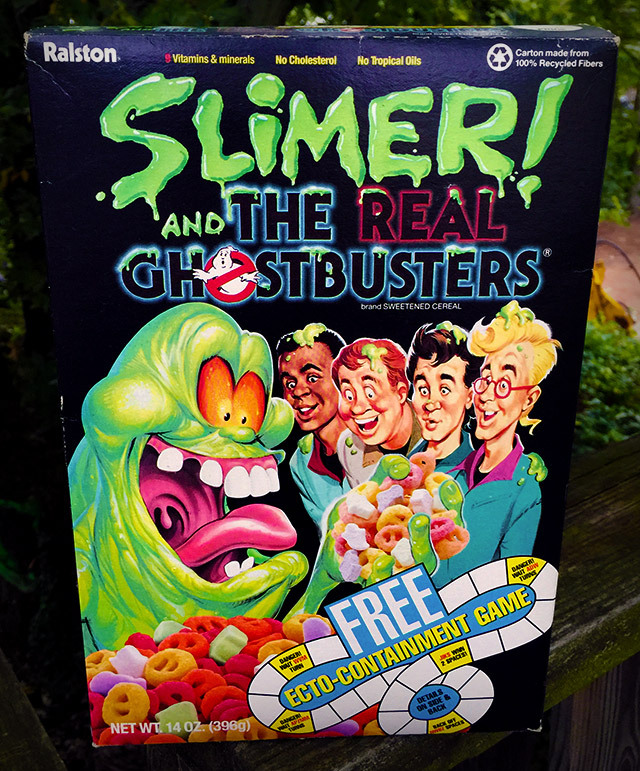 In any event, the fourth Ghostbusters Cereal box was easily the best of them. Totally frame-worthy. 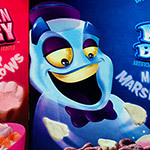 The Monster Cereals hadn’t yet become seasonal, so General Mills fought to keep them fresh all year, every year. 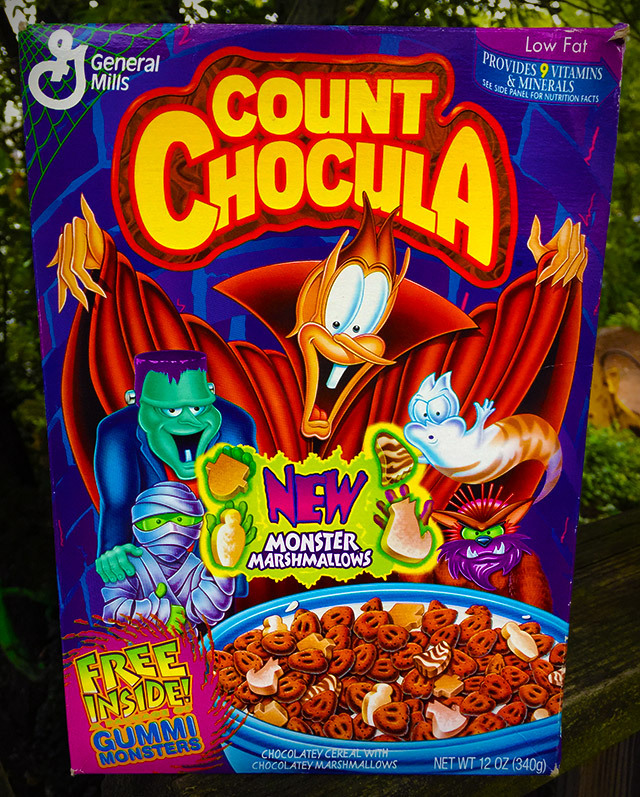 I’m not sure I could name another cereal that’s had more cosmetic changes than Count Chocula, which at certain points seemed to run through themes at a rate of one per month. 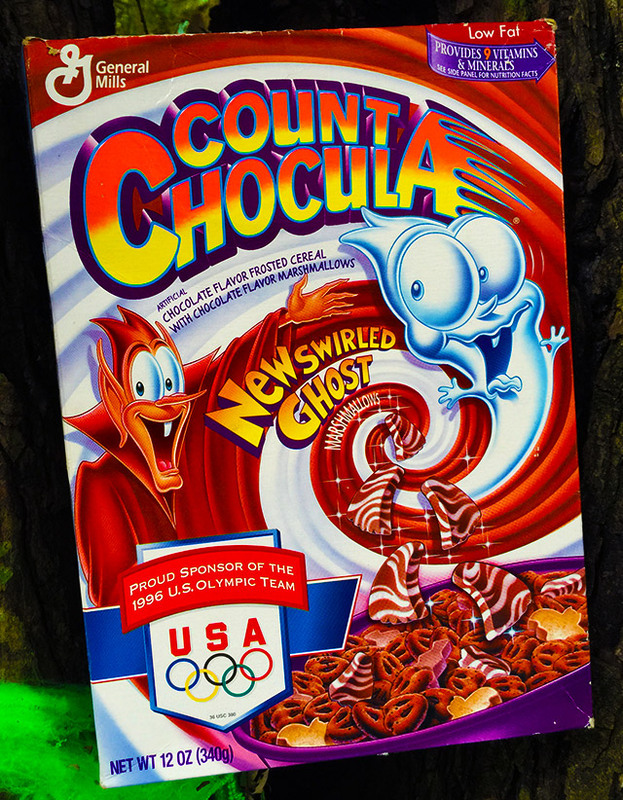 In 1996, the Count introduced “Swirled Ghost” marshmallows, with the titular ghost becoming the cereal’s secondary mascot. I loved that little guy, and I was sooo happy to see Swirled Ghost’s descendants hiding inside boxes of this year’s Count Chocula. Later that same year, Count Chocula went all-in. I’m fairly certain that this version came out during the Halloween season, when the Count made most of his money. It’s just too grand to have been an April release, y’know? 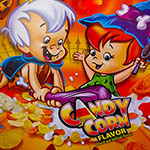 If General Mills ever does more retro releases, I wouldn’t mind seeing some from the late ‘90s. I know a few of you are secretly over Count Chocula, but wouldn’t you buy it if it came in THAT box? Wouldn’t you buy enough boxes to build a fort? 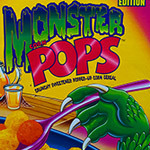 The article is offline, but I soooo wrote about this cereal during the 2004 Halloween Countdown. It’s only now occurring to me how strange my life has been. Take whatever you’re doing now, and imagine doing the exact same thing in thirteen years. And then make it 50 times weirder, because with me “the thing” is writing about Haunted Cocoa Rice Krispies. There’s no way I’m not trapped in some goofy Matrix, waiting to be redpilled. I know who you are. I know what this is.